Often jewelry stores it is possible to see three-dimensional decorations of gold, which are much cheaper than similar products smaller. Do not doubt – before you the gold, only blown. The product thereof represents only a gold shell which is an empty space. The main difference of articles of blown gold from their full-length "brothers" lies in the production technology. Traditional gold jewelry are manufactured from a single piece of wire, and a hollow decoration produced by use of wire of base metal, which top is covered with gold. As a result of subsequent chemical processes, the metal base is removed, and the remains of a gold shell. By the way, this method allows you to get jewelry that is not less beautiful than those made in the traditional way. Some buyers mistakenly believe that hollow rings, chains and earrings are inferior in quality to the full. In fact, with the right process and proper control by OTK, blown out decoration no worse. With proper manufacturing they are able to satisfy the needs of even the most demanding customers. Blown gold – fertile ground for the work of a master jeweler. Very often it is an adorable and unique products, which, despite the rather impressive size, weigh almost nothing. 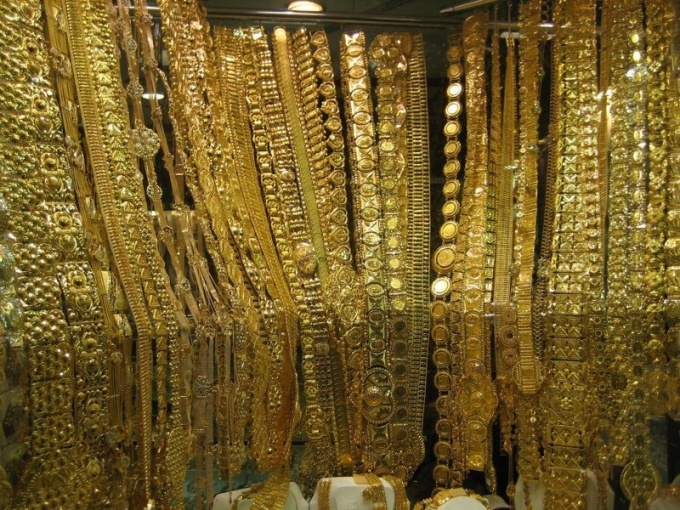 The main advantage of jewelry made from blown gold that they are much cheaper as they have no precious "innards". That's why for the same amount of money to buy more inflated gold chains instead of one full. The main drawback of such products – fragility. According to the standards blown gold should save the form at load up to 15 kg. unfortunately, the Standards are met only in some of the processing enterprises, so best not to chains and earrings to unnecessary risk, because when a careless attitude to them may appear defective. In General, it is not recommended to stay in such decorations during sleep or intense physical exertion. Ornaments blown gold is not intended for everyday wear. They are created to emphasize the significance and solemnity of life events. When choosing a pendant and chain blown gold, you need to follow a simple rule: weight of the pendant is 30% of the weight of the chain, and in the case of a long chain – 50%. Subject to the rules of operation of hollow jewelry, they will last for years and will make their owners very successful and inexpensive acquisition.